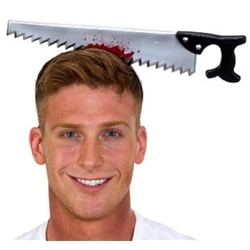 The Bloody Saw Headband is available in One Size Fits Most Adults. This headband will make it look like you have a saw cutting through your head. How did this happen? Will you run about in a messy, bloody panic? Will you wonder about as a zombie? Perhaps you will smile carefree? Whatever direction you take this look, we have accessories to help! Sell the look even further with Stage Blood, or take it to a whole new level with any of our professional grade masks and prosthetics!